Upon first glance, you could be forgiven for thinking Brown Goldsmiths is just another jewelry shop with glass cases full of metal pieces inlaid with varying gemstones. However, if you're lucky enough to be shown upstairs, as we were recently, a whole other world opens up. The studio space, where Brown Goldsmith's custom pieces are created, is a fantastic amalgamation of old and new. Ancient looking German and Swiss machines for creating metal wires lie inches away from computers running CAD programs, tools with wood handles smoothed and polished from years of use are used in conjunction with high-tech microscopes, and wax models lie on a workbench right next to CAD renderings. "We strive to take the best parts of the historic process of jewelry-making, and mix them with more recent innovations to create the best products we can." Steve Brown told me as I ogled the hand-drawn sketches of jewelry that lined the walls. Historically, each custom piece of jewelry was thought up by the designer and hand-drawn in multiple orientations, often with several additional variations, allowing the customer to visualize and play a role in the design of their piece. Today, in addition to these technical illustrations (of which I'm clearly quite partial), they also offer designs created in CAD. For more complex designs or those that are hard to visualize in 2D, the CAD software allows the client to look at their design from all angles, zooming in and out. Steve sees where my eyes have wandered and explains, "Some clients prefer the simplicity of the sketches, but others love the ability to really envision the piece in these realistic 3D models, so we're very lucky to be able to offer both." We walk through several more studio rooms before heading back downstairs, where I'm struck by the difference between the clean and elegant showroom and the busy working studio we just left. The dichotomy seems somehow incongruous and absolutely fitting all at once. I've heard it said that a little bit of chaos breeds creative thought and personality in artwork, and as such, I've never met a great artist with an immaculate studio space. It felt right to me that this jewelry wasn't created in some sterile laboratory, but was born in this room of wooden workbenches, each of varying heights and styles, a sea of mismatched LUXO lamps craning downwards like the old Pixar logo, and filing cabinets full of thousands of rubber molds and hand-drawn pieces of jewelry, each telling their own story. This is a place of history, a place of artistry. But - like any piece of art - these rings, necklaces, and earrings must leave their place of creation to be exhibited somewhere more polished, more in keeping with their own elegance and beauty. For those pieces that don't make their way directly into the hands of waiting clients, the beautiful downstairs showroom is just the gallery they need. While in the showroom I met two recently engaged couples who had custom rings made at Brown Goldsmiths. While the rings themselves were top-tier, I was equally struck by the tight-knit community feeling. The entire showroom staff was well versed in not only the creation of the rings but also in the details of the engagement: where was the question asked, how was it done? In one case, Brown Goldsmith employees had helped the groom-to-be document the entire ring creation process from which he created a photo album for his fiance. Two and two were also put together that a recent Brown Goldsmiths photoshoot had been conducted at a Christmas Tree Farm owned by the bride-to-be's family. 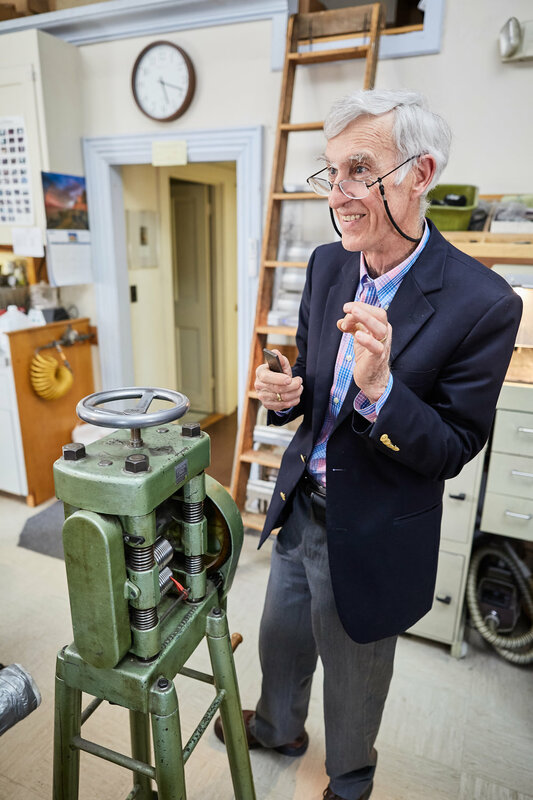 These kinds of small-town connections, while common in Maine, are a testament to Brown Goldsmith's commitment to the people behind the jewelry they create. In fact, while upstairs looking through the old jewelry designs, for any given piece Steve and the other designers could offer personal stories about the process of creating it and about the client it was made for. "At the end of the day, we are hopefully creating more than just jewelry," Steve told me with a glint in his eye that hinted at the passion behind the statement, "I think that is what's so rewarding about this line of work."